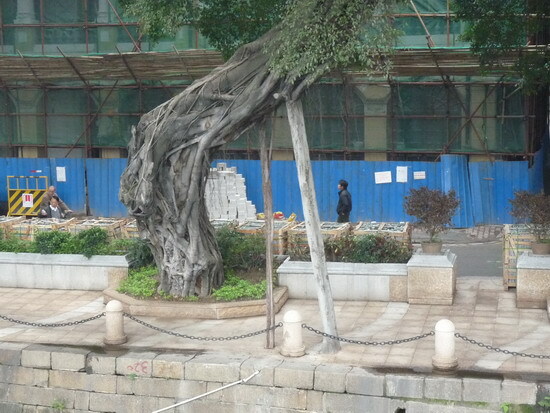 The Chinese Banyan in the picture does not have any fallback and is half-falling across the pavement. It is one of the trees in the “Register of Old and Valuable Trees” compiled by LCSD. You can find it at Luen Wan Street in Mongkok, with CW of 18 M, DBH of 1.21M, at a height of 9M, registration number: LCSD YTM/103. 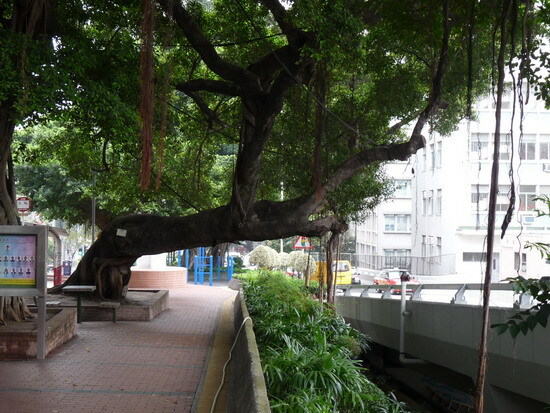 In the book “Register of Old and Valuable Trees in Hong Kong”, published by Cosmos Books Ltd., it is rated as 70 years of age. The tree is tilted off balance obviously. The tree is joined to another tree by a cable. This tree cannot bear any weight and the purpose of this practice is in doubt. The webmaster has a simple inference. Its center of gravity is shifted to one side and the roots are under immense pressure. Once the roots cannot endure any more or strong winds increase the downward pressure on the crown, this tree will certainly fall. The pavement is right under the tree. If it falls, accidents inevitably happen. 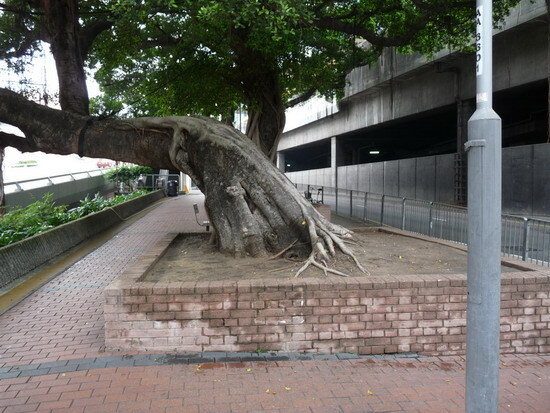 You can imagine the threatening impact to the pedestrians when this 1.21M-DBH tree falls. To sum up, we need to pay close attention to this tree. It is said that the government has performed some tensile tests to the trunks and concluded that there is no immediate danger. No further improvement works will be carried out. However, I believe that concrete support frame to strength the tree is the better way to go. 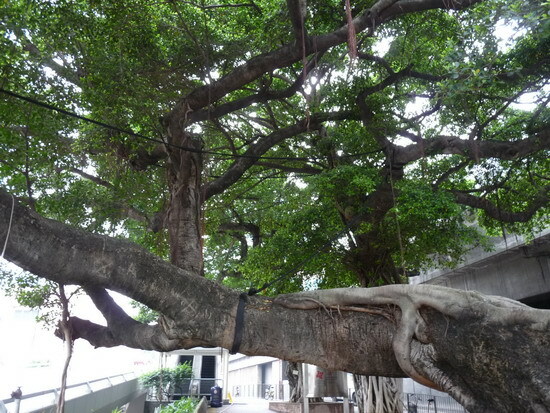 The tree shown below is a Chinese Banyan in Guangzhou Shamian. It is also bending, but the concrete prop alleviates the pressure to the roots and the growth of aerial roots is well conducted.